Kyufta is one of the oldest meat dishes of Armenian cuisine. 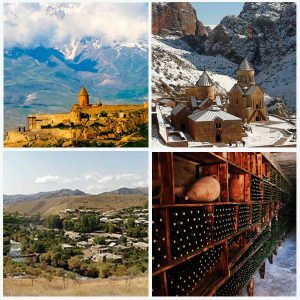 Kyufta is the pride of Armenian cuisine. Nobody knows for sure how many centuries is this dish. Long ago, as the legend says, it was prepared in such a way: the best beef meat or the veal steak was selected and for a long time it was beaten off on a flat large stone with special wooden hammers before turning it into a viscous homogeneous mass. In the process, a little water and salt was added. 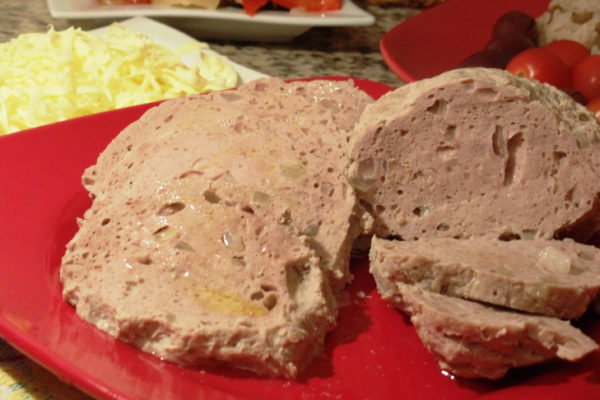 The beaten meat was then shaped into a bowl and then boiled. 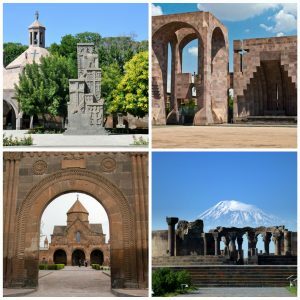 So the real “K (x) ari-kyfta” was born (from the word “k (x) ar” – stone), which became a favorite dish of Armenians and the pride of Armenian cuisine. Kyufta can be cooked in another way, grinding meat through a meat grinder, instead of beating it. 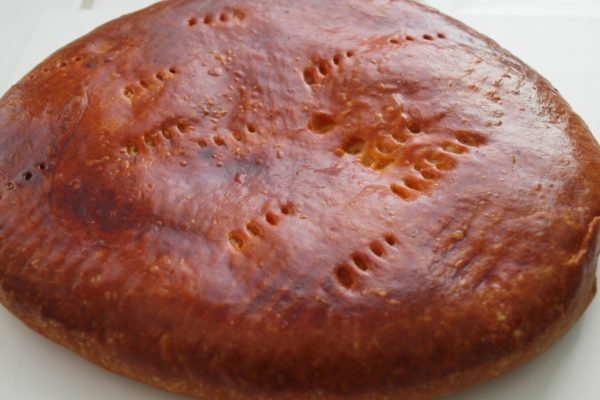 Armenian gata, also known as Gatah or Katah, is an Armenian pastry, which is similar to a coffee cake, as it is usually served with tea or coffee. There are, actually, various types of gata, and you can see its different variations. Gata bread was baked in traditional tonir (a typical underground oven) but nowadays, it is baked in oven. Armenians bake gata bread every year for Candlemas (Presentation of Jesus at the Temple). Of course, this doesn’t mean no gata is baked before or after Christian celebrations. 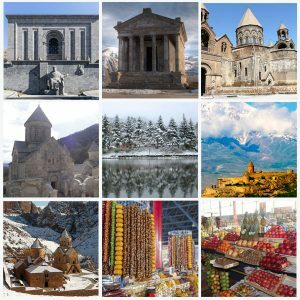 Armenian people baked all year round in Armenia, even without any special occasion or celebration for it. One type of gata bread is made of sweet bread and has a filling (khoriz) which consists of flour, butter and sugar. Another type of gata is made of puff pastry. Also, gata comes in various shapes, from round to rectangular. Harissa is a traditional Armenian dish that was common during 1915 when the genocide took place. Many Armenians survived the genocide due to Harissa because it is food that consists of fat-rich meat. Some Armenians substitute the meat with different kinds of herbs, simply because they are vegetarians or because they are fasting, due to religious beliefs. It is special porridge. You cook it using chicken meat for 5 or 6 hours. It should be cooked until the chicken meat becomes soft. You can add bread too. The dish is not only tasty but gives much energy. It’s very tasty and simple soup. Cooking it is simply nowhere, and everyone will enjoy its unique fresh taste. The soup turns out to be quite satisfying and quite useful, both for the gastrointestinal tract and for immunity. 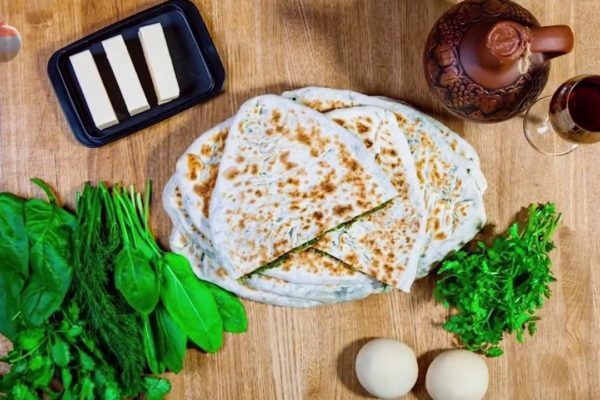 Of course, to achieve the unique taste of this unusual dish with a vivid national flavor, it is best not to depart from the original recipe and use matsun and wheat. 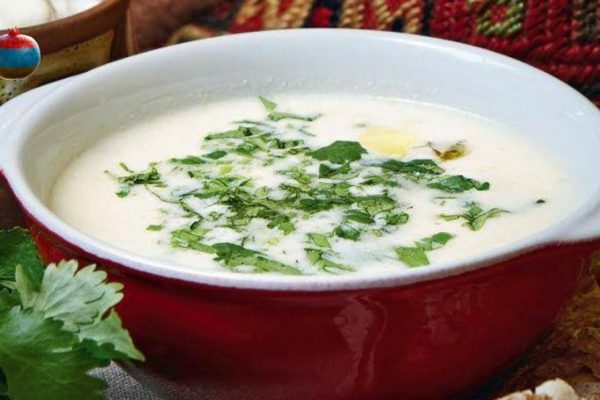 Armenian soup spas is one of the most favorite and widely distributed soups in Armenia. Spas is a low-calorie dish and has a tender, with a sour taste. It is prepared on the basis of matsun – a fermented milk product. The dish is usually served warm, but it is good and cold. Ideally, it is prepared with wheat seeds (in Armenia they are called “zawar”). It is not only a national Armenian dish. It speaks about the past. Everyone in the country can make it. Dolma is not just food. Regardless of whether you call it tolma, cabbage rolls or “stuffed grape leaves”, it’s a small piece of joy that gives you much more than the usual dish. Only people in Armenia understand how dolma turns from hanging grape leaves into an explosive heavenly taste in your mouth. The pan should be lined with grape leaves, so the meat close to the bottom will not burn. 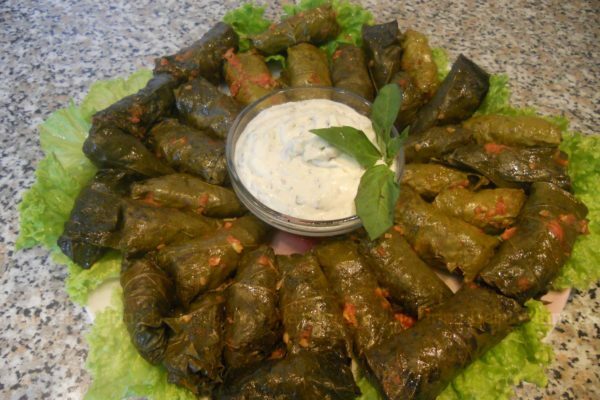 After preparing the filling from meat, you should open the vine leaves in the palm of your hand and add a tablespoon of your filling to the center. Then you should start folding them, as if you were folding boxes, first left and right edge, and then top and bottom. They also need to be tightly packed on the bottom to support each other’s weight. Dolma is the dish which unites all the members of the family. The dish is very popular in Armenia. Finely you should grate onion and pour off onion juice. Then meat, onions are combined and spices are added too, everything is mixed, and you knead it into a mass. The meat should contain a fair amount of fat, as it helps the meat to adhere to the skewer and stops it from crumbling. The meat is distributed evenly onto skewers. If no metal skewers are available, you can also use wooden skewers, for example bamboo. The wider the skewer, the easier it will be to grill the kebabs. Kebabs are evenly grilled from both sides and served wth lavash, a traditional flatbread. Rice also makes a very good side dish. The process of preparing attracts everybody. 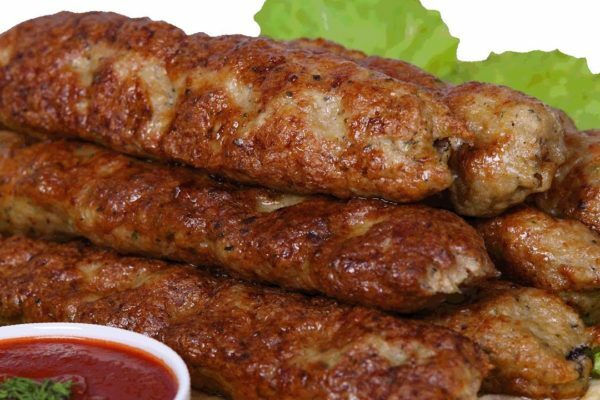 Kebab is served in all national restaurants of Armenia. Pakhlava is a sweet dish. It is prepared from a variety of sheets of dough not more than 1 mm thick. The main ingredients are flour, honey, walnuts and butter. The principle of preparation is quite simple: the sheets of the dough are lubricated with oil and stacked on top of each other, with each layer of sheets sprinkled with nut-spicy filling. Ways to make paklava a lot, and each has its own characteristics. For example, for those who prefer a light and not very sweet taste – there is one kind. If you want practically dietary baklava, then you can make another kind of this tasty dish. 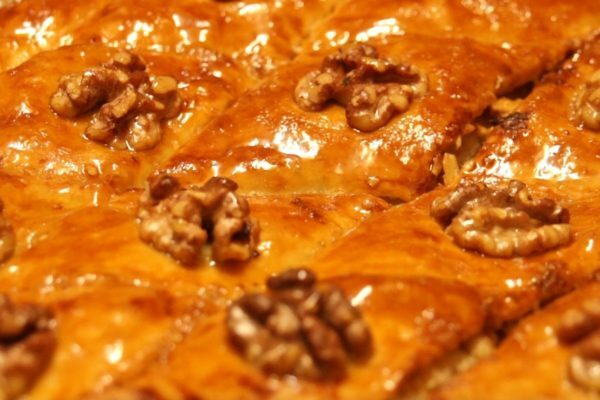 Also very popular are the leaves of a thin dough with a filling of pistachios or cashews, richly impregnated with syrup. The dish is popular in Armenia and you can try different kinds of it in every café or restaurant. 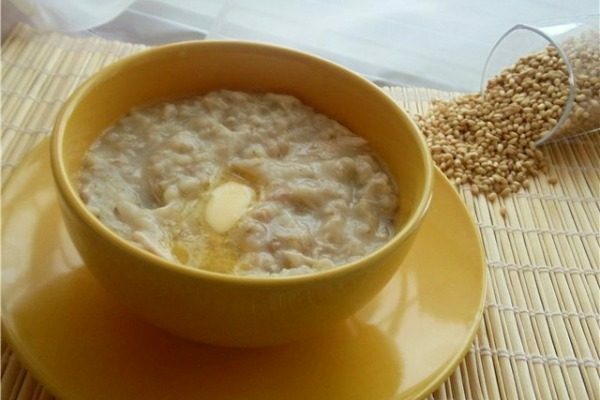 Khash is one of the most festive Armenian dishes eaten mostly in the cold season. Its cooking and consumption is highly stylized and it is enjoyed early in the morning with good amounts of garlic. Even the toasts are well defined and are announced in a specific order. 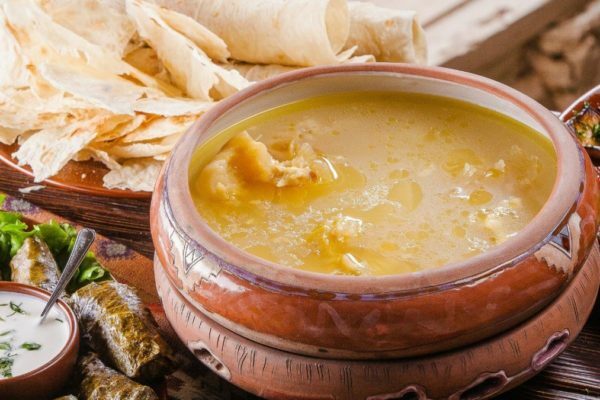 Khash is eaten with dried lavash bread which is crumbled into the broth. Sometimes another soft piece of lavash is used as a wrap. It is cooked by boiling bovine shanks for hours until the tendon falls off the bones and the water becomes a thick broth. Many times cooked stomach pieces are also added to the dish. There is no salt used while cooking, but it is liberally seasoned with salt and crashed garlic after the dish is served. Khash is never eaten alone. 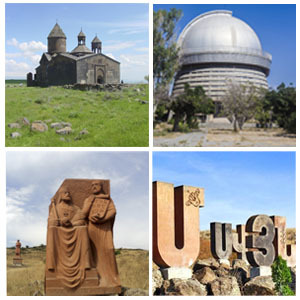 In the translation from the Artsakh dialect zhngyalov hats means “bread with greens”. This is a simple, tasty, healthy dietary dish. 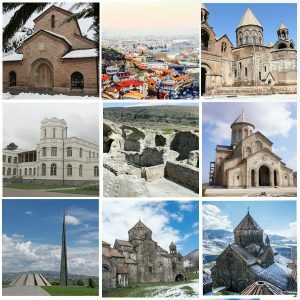 Artsakh is an amazing land. In the spring it seems that it consists entirely of a continuous carpet of wild grasses. Incredible, dizzying views of green mountains and valleys seem like fairy-tale landscapes. In the spring, every mistress in Artsakh considers it her duty to collect an armful of deliciously smelling edible herbs, of which there are a great many. Then this splendor shreds, to become a filling for zhngyalov hats. Thin slices of bread are baked on a special brazier, which is called “sage”. A variety of greens is used for this dish. Suitable young leaves of horse sorrel, parsley, coriander, vegetable sorrel, young nettle, green onions, lettuce leaves, beet tops, spinach. In general, the dish is served with butter. A great variety of vitamins are inside of zhngyalov hats. It is a truly delisious stuffed pumpkin, and Khapama pumpkin is stuffed with rice, dried fruits, apples, spiced with cinnamon, melted butter and honey. It is not a simple dish, yet so flavorful, delicious, worth to be added to your “Holiday dishes” menu. In Armenia Khapama was served on special occasions or on New Year’s Day. It was made with different variations in various Armenian regions, some would make it with crushed nuts, meat, with different dried fruits. 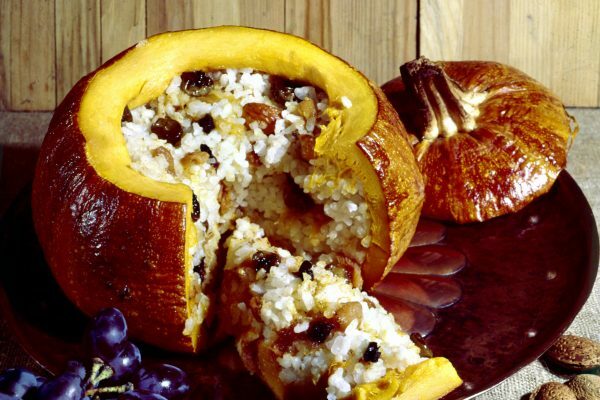 It is prepared by removing the guts of the pumpkin (pronounced “ddum” in Eastern Armenian and “ttum” in Western Armenian) and stuffing it with boiled rice enriched with dried fruits and nuts such as chopped almonds, apple, apricot, plums, dates, prunes and raisins. It is also common to pour on honey and mix in ground cinnamon or sugar. The pumpkin is then baked until it becomes soft, then brought to the table where it is cut-up and served.